Touch The Jungle will celebrate the Grand Opening of the TTJ High School with the start of the 2014 Fall School Session! Touch the Jungle has been working in the Ecuador area of Intag for several years now, which contains rain forests to cloud forests to high altitude desert habitats, near the back side of the Playa de Oro Reserve that we have supported for so many years. The Intag region consists mainly of rural family farms raising organic coffee and fruit. Many families live in extreme poverty and the average income is just $100 a month for entire families, in a country where shoes, clothing, and cars cost the same as in the US. Could you survive on $100 a month, much less support a family? Yet despite the poverty, this region has passed revolutionary local environmental laws to protect their environment, the habitats, and natural waterways, because they understand these natural resources are priceless and irreplaceable. For the past several years, Touch The Jungle built and has beensupporting a wildlife rescue center in Intag near Apuela. But we have other ways also for helping this rural farming community in their fight against copper mining and timber companies, upholding their environmental protection laws, and maintaining their way of life! *Protect threatened rainforest and cloud forest habitats. *Protect, rescue, and rehabilitate native animals. *Empower local people to preserve the rainforest and protect its wildlife. These goals are interdependent. Wildlife cannot survive without habitat. The habitat cannot survive if the local people don't protect it. The local people cannot survive without wildlife and the forest. Yet extreme poverty, lack of jobs, and lack of education cause many communities to accept the offers of loggers and miners just to provide their families with the necessities of life. If we want local people to support and protect the rainforest and its wildlife, then we must support them. This Touch The Jungle does, by supporting community projects such as health care and education, and assisting them in developing environmentally-friendly sources of income such as ecotourism. In the process of establishing the wildlife center and our project into the local Intag community, we identified the greatest needs of the community and how we can help support their efforts of environmental protection and their organic farming practices. This rural farming community does not have a high school in which their young people can get a high school diploma and make a better life for themselves. In 2013-2014, we took on the project of building a high school/trade school for the Apuela area of Intag. This school will not only provide the young adults of this area with a high school diploma, but also, they will get training in various trades relative to their community needs such as organic agriculture, organic farm animal husbandry practices, artesian crafts, forestry, water shed management, etc. This school will help educate the young adults of this region to have the tools and knowledge to not only protect their forests, watersheds, and practice organic farming and farm animal care, but ultimately helps Touch the Jungle protect the wildlife and habitat through these young people, generation after generation. The school will also become the base location for Touch The Jungle's future wildlife outreach & educational programs for the locals. Touch The Jungle Teachers, 9th through 12th grade, with TTJ volunteer, Grace Lush, 4th from left. In 2012-2013, TTJ fundraised extensively to raise enough donations to build the school. The students fundraised locally by selling raffle tickets to win a variety of prizes that were donated by TTJ. Other local supporters in Intag started a coffee plant co-operative in which coffee farmers that need to buy more coffee plants but cannot afford to, donated their time to care for 20,000 coffee seedlings donated by the School Association. In return for their work, each volunteer received a certain number of coffee plants for their own farm. The remaining coffee plants were sold and profits went to the Touch The Jungle high school construction fund. And back in the U.S., our volunteers ran an online auction for over 8 months selling various items that our U. S. supporters donated. Our sponsoring nonprofit, Earthways Foundation, matched all the donations we raised during that time to help us reach our total fundraisng goal of $30,000. (Earthways Foundation is a US 501(c)3 nonprofit organization tax ID 65-402-1351). We started construction in late 2013 and completed the building and grounds work by mid 2014. The school was officially ready for the start of school for the 2014 fall session. The school building houses 3 classrooms which are seperated by removable partitions so that the seperate classrooms can be opened up into one big room for community events. We also put in a small kitchen so that students can prepare meals as needed and a seperate restroom building. Elected School Association Board members for 2012-2013 term. 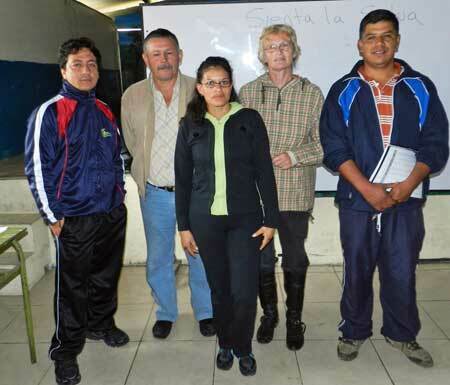 The local name of the school will be the Spanish equivalent of our project name Touch The Jungle, "Sienta la Selva". You can visit our Facebook Page to view photos of the school construction from start to finish, and get the most current updates about the school and other Touch The Jungle projects. See the Facebook page links on the right or left of this page to join us on Facebook. If you have any questions about this project or want to find out how you or your group can help out, please email me at tracy@touchthejungle.org for more info. Thanks for your support! We could not have been able to provide this much needed source of education to the people of Intag without your help!